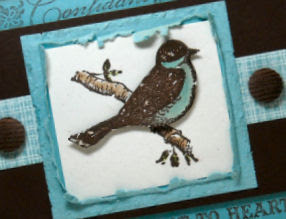 This is the card I created for the Near & Far Swap Group I'm in. 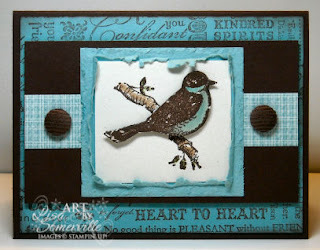 Our Theme was new catty swaps - and as you can see I used Friends 24-7 as the focal image for my card. 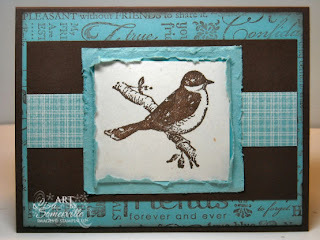 I used the Torn Frames Technique to add some interest to my focal image, the strip of pattern paper comes from the Parisian Breeze DSP, the words in the background are from the Friendly Words, wheeled in Chocolate Chip on Baja Breeze, then sponged the edges with Chocolate Chip. One of the other groups I'm on has a challenge for the week - Birds. So, while I had the card stock/stamps/ink out, I created a second card and stepped it up a notch, adding the popped up colored image, the Corduroy Buttons, and popped up the entire Chocolate Chip panel. Still easy to create, but more of a WOW factor with a little embellishments. Dimensions - 5-1/2" x 4-1/4"
Very pretty. Love the colors and the torn frame is fantastic. The added touches really do make this extra special.